Well, you can start a reply, save the draft, and then add to it later. But what I've been doing (I'm sure there's a much fancier (and easier) way to do it) is quote someone, type my reply with any formatting I want so the code is in there (by this point I know most of the code so could probably type it in by hand, but I'm afraid I mess it up), and start a TextEdit document. Then I go back to the post till the next time I want to add something. Like I said, I'm sure there's a more elegant way, but that seems to work. I didn't know you could open a quote in a new tab. So, now I know. Thanks. Oh, now I feel bad. It was just that I noticed the similarity to an xkcd comic (which I can't be bothered to find) where a solution was found that a geeky geek would sorta cringe at (I didn't cringe, but I had an urge to help you so you didn't have to do that any more, lol). I'm glad you learned something new now. And, sorry. 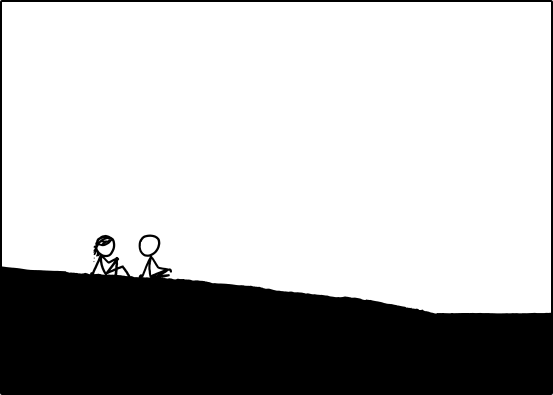 I think you mean this one: http://xkcd.com/763/ I actually remembered the title of it, even. The thing is, among your average non-IT Joe/Josephine, I'm considered pretty tech-savvy. It's just among y'ins that I feel like a tech dork. But I'm learning stuff, which is cool! Valarya wrote: I hope you all are pointededly missing the point (??). Kid + that name = so so so wrong. Did I miss something? When did we decide her last name was 'Mort'? The honourable Latent22, who gave her her first name. manvandmaan wrote: It's a little French girl? Edit: sorry missed the e.
Edit2: her fathers last name is Mort by the way but she has taken her mothers name instead and this must never be mentioned again! Though we don't have to keep it. Maybe we should organize a vote. First to post is cannon! Muahahaha, a rule for chaos! edit: or, you know, canon if you prefer established facts over high velocity projectile dispensers. Last edited by jovialbard on Tue Apr 23, 2013 2:31 pm UTC, edited 1 time in total. I don't think it was decided, only that it would be a very unfortunate name to have and hence, a great point of discussion. Latent22 wrote: Edit2: her fathers last name is Mort by the way but she has taken her mothers name instead and this must never be mentioned again! manvandmaan wrote: Edit2: her fathers last name is Mort by the way but she has taken her mothers name instead and this must never be mentioned again! With all apologies to Lord Randall. And azule and I aren't related, but still. And you do NOT want to know how I did that. I did indeed mean that one. I'm glad we're cool again. HAHA! I felt bad, remember! Now I don't know how to feel! One problem, I never asked how you did it. You just volunteered! How do you stop that? lol. Edit: I've been reading this thread, it's so cool to be in one of them now. hehe. p.s. we need more OTT related comic remixes. Cool. This would look good as a little quote box on the Book of Time wiki, placed on the newpix page they came from. Last edited by azule on Mon Apr 22, 2013 9:07 pm UTC, edited 1 time in total. Drakeesh wrote: I don't think it was decided, only that it would be a very unfortunate name to have and hence, a great point of discussion. Since the SCR* allows dating for 14-year-olds, at least for some age of "kid" a discussion is, indeed, possible. And regarding the wide diversity on all Time Followers' Nationalities, we could start with a round-up on legal matters, before put the lable of morality on a certain age. On a side note: IKEA sells a children's bed named "Gutvik". However the Swedish pronounciation (~ /goued-wegg/) clearly states otherwise, in some European countries the chosen name written down has a... somewhat irritating touch. *Standard Creepiness Rule. But You already knew that. Also, does she seem really dejected about the end of the castle collapsing? The one thing about knowing that BlitzGirl is coming is that when you write something stupid or embarrassing, you know somebody is going to read it, again. Now that I've actually done the due diligence of a google search I have to go back and edit a disclaimer into my posts about that name. To avoid double post: I think Megan is thinking "Hmm, what am I going to do about you, water." but it may not be. just ends by next week. to go with the rook. for months, if not years. feathered velciraptors, waves, <--the misspelling makes it the right number of syllables. I'm disappointed this one isn't real now. frames, it sets the scene! a bit to the right. I could not find it. first Time in my life. ....And when Megan is looking at a remote (castle? river?) I have been making more woodworking tools, and could not resist the temptation to dedicate one handle to OTC One ISwCSMO* to whoever recognises the timeframe it is inspired by! How did I miss this?! Best thing ever. Here's a ton of my internets. It's like The Madness hath returned!! Jafloi wrote: ....And when Megan is looking at a remote (castle? river?) I have been making more woodworking tools, and could not resist the temptation to dedicate one handle to OTC One ISwCSMO* to whoever recognises the timeframe it is inspired by! mscha wrote: I made my collection of frames, downloaded as they appear, temporarily available here. Feel free to use those for (further) comparison. Thanks mscha!! I downloaded your frame 20 from there and compared it to the current frame. And his head moved!!!!!!!!!!!!!!!!! Randall changed his head direction 15 hours after it was released! but he also updated all the old frames as well and overwrote all the Create and modify timestamps. Possibly to hide this but who knows. Also these dates don't have all the same date in a batch but a few seconds between each date which is new! Latent22 wrote: but he also updated all the old frames as well and overwrote all the Create and modify timestamps. Possibly to hide this but who knows. Also these dates don't have all the same date in a batch but a few seconds between each date which is new! I'm willing to bet it is because his head is disconnected in the previous image. Sure, has to come up with a trickier next time... Here is the ISwCSMO **give give**, enjoy imagine eating the imaginary Sandwich with Chicken Salad, want some of the Optional Mayo? Caswallon wrote: I'm willing to bet it is because his head is disconnected in the previous image. Good spotting. He probably didn't like it and changed it. But why turn the head, then? But Megan keeps on building (gestating). At some point they both realize that M is creating something big, and C comes back to help (thought M is still doing most of the work.) But then C leaves. Did he get scared off by impending fatherhood? Is he off at Ikea getting supplies to build a nursery? Meanwhile, M finally tires and takes a nap. During the nap, she dreams of/is visited by the teenage version of her not-yet-born daughter (anyone remember that episode of Northern Exposure? ), who for some reason is French. Or maybe just likes berets. 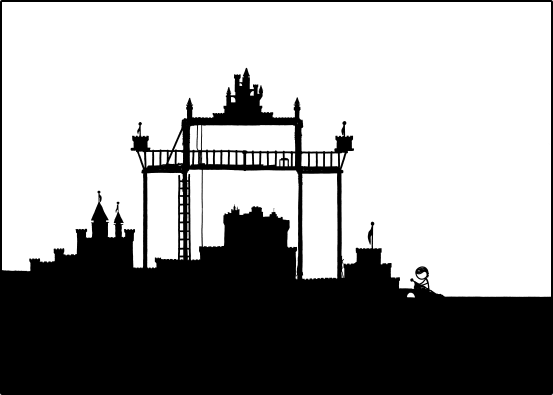 The dream child disappears when M is awakened by the castle falling, which of course is a symbol of her water breaking. This is where my interpretation breaks down a bit (because up till now it was unquestionably correct), since I don't think most women would just stand there after their water broke. * There are of course many males who are not like this, so maybe I should say stereotypical male. May have been the original intention, plus Megan is just sitting up and it seems natural that he would look. It seems to fit better in the initial sequence of frames. Edit: Apologizing for double posting, but seemed appropriate for the newpix. I need to make these as tap handles now. Goodness! I leave for a coma and a few hours of Outsider education and a whole new character arrives! I must agree with the title of La Petite (LaPetite) for her, but knowing what appending "Mort" to her name would mean, propose a few alternatives. I'm not a native French speaker (though I have taken 2.5 years of it) so pardon me if I propose something completely rediculous. - Megan - get it...little megan...never mind. Aside from Megan's slightly moved position, there's also a teeny tiny bit of sea level rise. Caswallon wrote: Edit: Apologizing for double posting, but seemed appropriate for the newpix. It might be just me, but I don't think the “double posting” rule really applies in such cases. Sure, if you have one more thing to say about the thing you just posted, then edit, instead of posting a new reply. But if it's an entirely different post, or a reply to a different topic, then is it really a problem if it's a new post? I don't think so. Randall: hmm, Cueball's head is detached on this frame. Erase head. Draw new head. That it's pointing the other way now, just a coincidence. Cueball has been just off-screen building a time machine, this whole time. He just finished and traveled back to frame 20. Frame 20's version of Cueball hears a strange, TARDIS-like noise and turns his head. When I apply the OTC-universe version of Occam's Razor, it's obvious that the second explanation is the right one. Edit: too bad it's Monday. I now want to write a script to structurally test all frames for changes. But I really shouldn't until the weekend, plenty of Real Outside Work to do. azule wrote: HAHA! I felt bad, remember! Now I don't know how to feel! Well, you definitely shouldn't feel bad. Life's too short to feel bad about something as silly as that. And I did volunteer the info. I mean, it does work. And as for how to stop it, well, I guess you would have to go back in Time to post your method before I posted my method. But hey, Blitzgirl needed a few more posts to read. I didn't know about that other thread. That's great. Only thing is, in trying to not be funny, they end up being funny in a whole different way. These are so great. Lightscribe is a great title, but I wish I could come up with a longer title that honors the fact that you're so good with wood. * I thought about "Lightscribe and creator of fine wooden products," but that makes it sound like you're an Ethan Allen store. Latent22 wrote: My previous text was hard to understand so i've done a cool graph that shows his modifications compared to when they were released. Ok this is kind of interesting. I posted this graph showing the modified times at 3:43 UTC Time and then someone changed all the images again and covered up the Create/Modified Times in a range from 5:07 UTC to 5:27 UTC. Note this complete reset had not been done at any time in the past except updates to the CreateTime on the first batch of images. 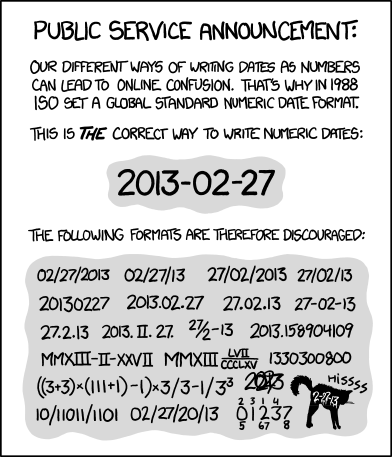 Modified Date had never been fiddled with before it seems. So STOP STUFFING WITH US RANDALL! Wow, enough activity during my coma/outside-times that by the time I catch up, it's nearly time to coma again. Anyway, here goes for the obligatory catch-up-replies-walltext-post. We can see that the timezone is -04:00 which means 4 hours behind UTC time which would be PST which sounds about right. Another interesting fact is that PNG files do not need a timestamp. PNG's i've Created by Photoshop do not seem to have these clear text DateTime's in them. So whatever he is using is adding them on. Also many of the files in a sequence all have identical times (with a few exceptions). This means they either have fake time stamps or were all last proccessed as a very fast batch process. The dates go down to 1 second of accuracy so if we look hard enough we may find them jump one second and this would tell us it is a batch process and the timestamps are real world and not made up. I find it odd that no-one has paid much attention to the fact that the create times are later than the modify times. To me, this suggests that the images are created in some intermediate format before converting to PNG. The files are converted to PNG by a tool which saves the original file's "mtime" and "ctime" fields in the date:modify and date:create fields. This behaviour is reasonable on Windows, but a Unix(-like) system typically uses the ctime field to store the "inode change time". (This is different to the "modification time" in that it stores physical, rather than logical, modification time. E.g. renaming or moving a file alters the inode but not the file contents. Thus the ctime is greater than the mtime. The PNG creation tool is unprepared for this meaning and produces slightly odd-looking timestamps in the file. Woo! Featured! I thought my recent slacking would have cost me my place in the top ranks, but I still remain in the top twenty. Being a giant mess and a lack of usable data (I really can't tell whether some blocks are me or ChronosDragon) aside, it still looks pretty cool. Indeed; the title text did not mearly state that it would occur, but that we should wait for it. In the end, the wait shall prove more important than any it ever could. Made me think of http://thedailywtf.com/Articles/Classic-WTF-The-Indexer.aspx. Well, if anyone else wants to find haiku and add them to the wiki, here's the app I used (for Mac OS X 10.6 or later.) I'm going comatose, so naturally the aforelinked app will have some obvious, immediate error that I won't be able to fix for many timeframes. Sosumi. Edit: direct link to app (well, it's on box.com, but that's as direct as it's going to get until I can remember my ftp password. Ugh, you need flash to get the download link? What was I thinking? Why aren't I comatose?) because who likes blogspam? I think that qualifies you for Cardinalship. Ah. A much better implementation. (And, more work.) Nice. Still gets a hat tip. My 300K was assuming people would only compare earlier-in-time/later-in-time. spamjam wrote: ONG's are mandatory now? My mission is documenting, not commenting. You don't tell me what to post and I won't tell you what to post. Deal? I think -ONG's are part of the fun for some. I was quandaried recently as I thought I had the first frame post, and hadn't thought of an -ong. Posted anyway, and was ninja'd. I think the vibe of the thread would best be stated "Play if you want, if not, no worries." Maybe there will be a competition between the ong-ers and the non-ong-ers. Cheer for your favorite team. It's all fun. Well from my research I found that the Create times which when the comic started were in fact in the past at 25th were at some point updated to the 27th but the modified times stayed the same. When the create dates all jumped to 27th the images were also reprocessed in some way and the Time zone changed. So my guess is the images were re generated on the 27th on a different computer/process and this is why they got new create times. Nothing was really in the future as it was past that time. But yeah it is a bit weird to have a create time after a mod time. It's just the way the processing changed it though. Latent22 wrote: Well from my research I found that the Create times which when the comic started were in fact in the past at 25th were at some point updated to the 27th but the modified times stayed the same. When the create dates all jumped to 27th the images were also reprocessed in some way and the Time zone changed. So my guess is the images were re generated on the 27th on a different computer/process and this is why they got new create times. Nothing was really in the future as it was past that time. But yeah it is a bit weird to have a create time after a mod time. It's just the way the processing changed it though.